The Laurie S. Silvers and Mitchell Rubenstein Library Media Center is a 4,600-square-foot space dedicated to grades pre-kindergarten through grade eight on our Boca Raton campus. This Library includes a Kids' Corner story room, a 24-computer study area, and comfortable seating. A collection of approximately 30,000 volumes and more than 20 periodical subscriptions are available to students and faculty. Students in grades pre-kindergarten through two participate in weekly library classes to learn how to use the library, find information for research, and integrate projects in connection to selected stories. Students in grades three to five have weekly scheduled book check-out time and flexible use of library resources. Library staff and a literacy support teacher work with classroom teachers to support the Reading and Writing Workshop curriculum. Middle School students may access the library before or after school, during study hall, or as part of an English class. 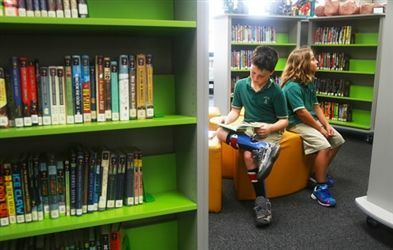 Lower and Middle School library programs include the Breakfast Club, Reading Counts, Florida Reading Association and Sunshine State Young Readers' lists. Parent volunteers work with library staff to enrich the library experience, including contributing to a gift book program, hosting guest authors, and coordinating a publishing center to assist teachers with printing and binding individual and class books.